Where DOES all that Comic Relief money go? Another letter home from school. Another dress up day, often with a request for an obligatory "optional" donation. Cue big sighs from this mother as she rifles through her purse for £1 coins to hand out. Again. It seems barely a week goes by without there being some diversion from the normal school day. World Book Day. Cultural learning days. WOW days. And of course a steady stream of fundraisers for "charadee". Yes, I confess I had become quite jaded. Nope. Strike that. Almost resentful of the demand on my already stretched funds. I had charity fatigue. And then I visited one of the projects the charity helps to fund. The New Horizon Youth Centre in London has been supporting homeless and vulnerable young people (aged 18-21) since 1967. As a starting point as youngsters walk in off the street, off the trains, off the coaches into our capital city, New Horizon's facilities can fulfil basic but vital needs including food, showers, laundry facilities, luggage storage, a postal address, and even a change of clothes. There are staff members, outside agencies and volunteers on hand to help with housing, counselling education, legal support and health issues and there are workshops and help with access to training courses, apprenticeships, work placements and jobs. Believe me when I tell you - this selection is just the tip of the iceberg when it comes to what is on offer at this amazing place. The youngsters who come, come voluntarily. They have sad, sometimes tragic tales to tell of less than idyllic childhoods and many have a background of being abused. More on that later. You might imagine then that this is a sad place, filled with tears and misery. Well yes, there are tears I'm sure. Oceans of them I imagine. But during my brief glimpse I saw lots of smiles, heard rip-roaring laughter and witnessed a rapport between workers and the youngsters there which is truly something to be proud of. An example. I was part of a small group of Team Honk bloggers visiting for a couple of hours. We were looking at the kitchen where three meals a day are on offer, walking past a group of loud young men who I'll be honest, I might have crossed the street to avoid in the quiet back streets I'd walked through to get to the centre. Listening in though it turned out they were cheering on a lad doing a magic trick - as the trick reached its (clever) conclusion we all joined together in laughing uproariously! The scary men were revealed to me as youngsters, just wanting a bit of a laugh, just like my boys of the same age. The main purpose of our visit was to meet women's worker Hazz (pictured, far left, with me and some of my fellow Team Honkers) and to learn more about her woman's group which meets weekly. 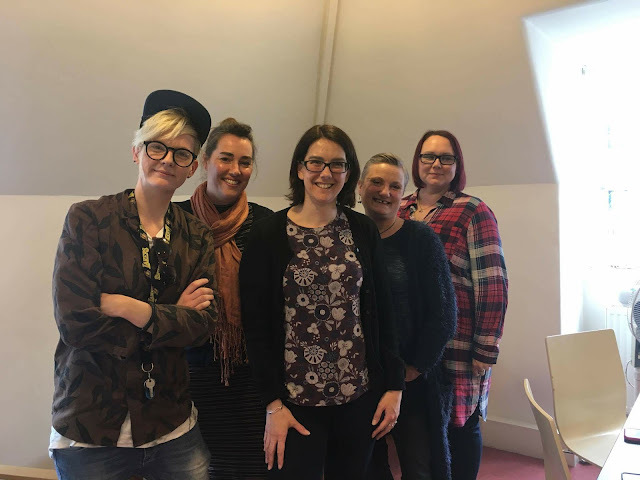 Hazz's work is one of the projects at the centre funded by Comic Relief and at first glance the group of young women with her, chatting, painting their nails and scoffing Haribo and Monster Munch looked like any you'd see in any sixth form common room. Without sounding preachy or prying she got the girls to talk about how they felt, how they lived and how they could protect themselves and improve their circumstances and well-being. This was not about someone telling them what to do and how to do it, it was about giving them the skills to improve their own lives with support. The session we witnessed was actually one of many organised by the women themselves ensuring the meetings met the group's needs. The women Hazz works with are all incredibly vulnerable and at high risk of sexual exploitation. One beautiful girl told a tragic tale of being sexually assaulted, rejected by her family and developing a drinking problem. She found herself homeless and suicidal. Then she was pointed toward New Horizons. She admitted life was still not perfect and she still fell off the wagon sometimes but with the help of Hazz and the team at New Horizons she had stopped drinking, was in a training programme and felt she had great new friends who were a positive influence in her life, and a fantastic support network. She particularly appreciated that Hazz's responsibility and care for her did not end when she walked out of the door at the end of group time. Hazz reminds her of appointments, cheers her on in good times and supports her through bad times. Another girl reiterated that this support was vital. She told us Hazz would call or text to check she had travel arranged for interviews and appointments and even print off travel tickets if needed. She told us the best thing about the whole project was that women got positive attention, she never felt judged and added the workers, especially Hazz, meant more to her and cared more about her than her own mum. She said:"I feel safe here." Be Safe is the guiding principal of the women's work at New Horizons and sitting in my quiet and safe corner of the Home Counties this really touched a chord with me. I could not imagine my two girls facing the life these girls endure and was so impressed at the project's aim of helping these girls feel good about themselves, believe that they deserve love and respect and teach them to keep themselves safe. Let's face it, most of them have no family or friends who will look after them. All they have is Hazz and her colleagues. "There for the grace of God" the saying goes and I left the New Horizon's Centre feeling humbled and incredibly grateful for my life which although not always easy is a walk in the park compared to the hell these children endure. I'm calling them children because although very grown up, at 18-21 you are barely out of childhood and the sessions I witnessed albeit briefly showed glimpses of the children buried under the armour of toughness the centre's users have had to adopt. On the way home I bought a pile of Comic Relief products to hand out to my children. My eyes have been opened and I have been reminded of why we who have, should support those who have not. I don't have much but I have more than them and when you consider than every single penny of money donated by the public for Comic Relief on the bi-annual Red Nose Day, through Sports Relief and throughout the year goes to support hundreds of projects in the UK and overseas, it is a charity well worth supporting. Comic Relief was launched in 1985 and since then has raised over ONE BILLION POUNDS. Let that sink in for a minute. ONE BILLION POUNDS!!! The blogger fundraising team, Team Honk, has been organising events for the past four years and has already raised over £80,000 for Comic relief through relays, dancing, mountain climbing and this year, a bizarre but hilarious walk across London in fancy dress cooking meals en route. All bloggers are invited to join Team Honk. Details of this year's fund raising challenges and ideas for stuff you can do at home to make money for the cause can be found on the Team Honk website. If you can't join in physically why not donate by sponsoring a blogger who can? You can check out what bloggers have been up to during the past four years by checking out the hashtag #TeamHonk. You can also donate money via the Comic Relief website, by buying comic relief products and by supporting events and collections in your local area. Back to New Horizons. As I left, the centre was closing for the day. It's open from 10.30-4pm, 7 days a week which is fantastic but I couldn't help thinking of the young people I'd just met and how they would be spending their evenings, or where they might be sleeping overnight. The only thing that will help keep these vital resources available at New Horizons is funding from a multitude of charity sources including Comic Relief. You might think you or your children or grandchildren will never have need of a place like New Horizons and I hope with all my heart they won't. But it's up to us to make sure lifesaving projects like this can stay around into the future for those unfortunate souls who have nowhere else to go and no-one else to turn to. Thank you to Ali at Comic Relief and Stella at New Horizons for arranging our visit and to all the staff and young people we met during our visit. You are all truly amazing. Click the links below to read posts from some of the other bloggers who visited with me.